Long tipped as Austria’s next footballing star, Lienhart came through Rapid Vienna's acclaimed academy system in his homeland. At 17, Madrid’s U-19s brought in the centre-back on loan for a season. The young defender made quite an impression, playing every minute of Real’s UEFA Youth League campaign which ended prematurely in the Round of 16. Lienhart was immediately promoted to the Spanish side’s second team, Castilla, who compete in the Segunda B Division. 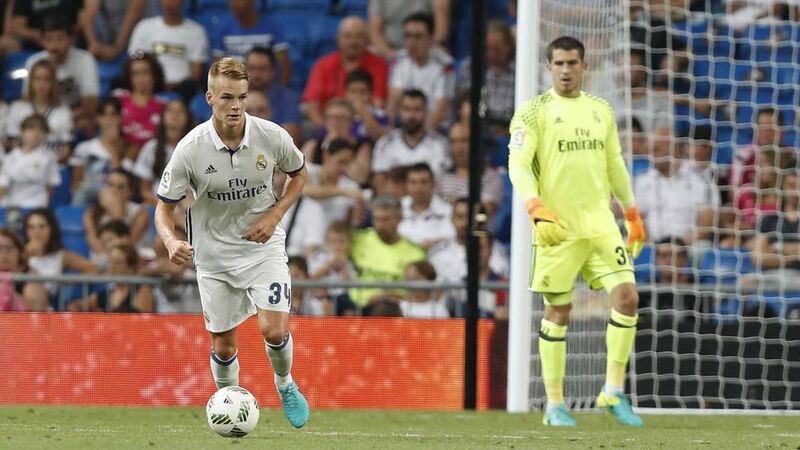 The youngster developed into a regular starter at that level, and, for the first half of his first season at Castilla, Lienhart featured under the watchful eye of current Real Madrid head coach Zinedine Zidane. Such was the impression he made in the youth set-up, Lienhart made the jump to the first-team squad, making his debut from the bench in the Copa del Rey against Cadiz in December 2015 as a substitute for Colombian midfielder James Rodriguez. The Austrian also formed part of Real Madrid’s UEFA Champions League squad for the knockout rounds of their successful 2015/16 campaign. Training with Cristiano Ronaldo, Gareth Bale and Karim Benzema, and having to defend against them on a daily basis alongside the likes of Sergio Ramos, Pepe and Raphael Varane meant the youngster was on a steep but bountiful learning curve. "My time at Real has certainly given me a lot. I have developed, both personally and in terms of experience. It is not easy to be able to train with some of the world's top stars and sometimes to play alongside them," Lienhart explained. "Among other things, positioning, anticipation, playing out from the back, I took it all in." Lienhart's primary quality as a defender is his strength, although he also possesses a maturity that belies his tender years, preferring to rely on his positioning rather than pace. Strong in the air and with a quick football brain, the defender keeps things simple and looks to build from the back, rather than play it long - likely attributable to his Spanish schooling. That maturity has also led to honours on an individual and collective level: Lienhart was part of the Madrid second team that won the league, only being denied by promotion by a play-off. He captains his country at U-21 level (Austria are unbeaten in four games since he took over the armband) and is tipped to make a senior breakthrough sooner rather than later. The high personal standards Lienhart sets mark him out as a future international: although last season technically ended in May, the youngster opted to forego holiday privileges in order to continue training and prepare for a pair of Under-21 friendlies in June. Such commitment to the cause will be music to the ears of Freiburg coach Christian Streich, renowned for working his players hard. But why Freiburg, and why the Bundesliga? Well, being a fluent German speaker has helped, but it is the 20-year-old's shrewd brain off the pitch that has encouraged him to take the next step in his career and pick up first-team experience, according to his coach at U-21 level Werner Gregoritsch. "He is a player who is very good at judging both the current and future trajectory of his career," said Gregoritsch. "So he also knows now is the perfect time to leave. Because of his overall package, he would really fit very well into the Bundesliga." A team chock-full of young talent that has exceeded expectations regularly in recent times, Freiburg are a perfect option for Austria's next great hope. He was not guarranteed first-team football in 201/18, but 11 appearances have been enough for him to prove his worth to the deicision-makers above me - no doubt a factor in Real Madrid allowing him to leave last season was having seen how well Jesus Vallejo fared at Eintracht Frankfurt in 2016/17. "Philipp has developed well with us and integrated quickly into the team. Faster than expected, he came through his first few matches and has met our expectations directly," said sporting director Klemens Hartenbach. With Turkey international Caglar Söyüncü for company in defence - forming one of the league's most talented central defensive partnerships - both Lienhart and Freiburg look set to continue their lofty trajectories well into the future. Click here for more Freiburg news!